Trump’s Habit of Firing via Tweet Could Spark Legal ShowdownDavid Shulkin insists he didn’t resign, he was fired. That could lead to a battle over whether Trump is abusing the Vacancies Reform Act. Trump Is Setting Up His New VA Secretary to FailRonny Jackson’s nomination was marred by chaos and questions about internal political maneuvering, which does a disservice to both him and veterans. Fired VA Chief: I Was Pushed Out for Opposing PrivatizationDavid Shulkin writes that too many people in the Trump administration want to profit off of the care of military veterans. Trump Replaces Veterans Secretary With His Personal DoctorDavid Shulkin is out. The man who declared that Trump is in “excellent” health – thanks to his “incredible genes” – is in. 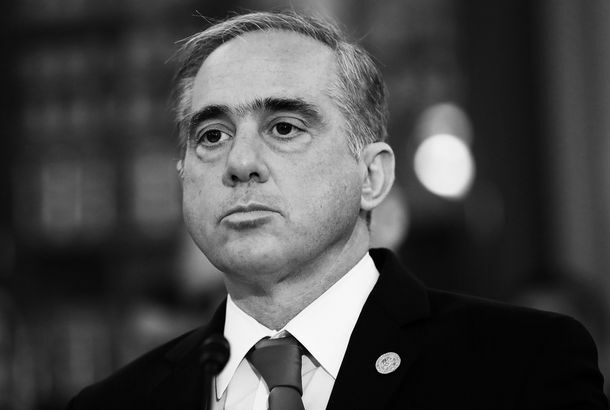 The VA Chief Faked an Award to Get a Taxpayer-Funded Vacation for His WifeSecretary David Shulkin’s wife traveled to Europe with him last summer and taxpayers footed the bill. VA Chief and His Wife Reportedly Had a Great Time in Europe on Taxpayers’ DimeAnother Trump administration official comes under fire for mixing business with pleasure. Trump Taps Another Goldman Employee and First Obama Administration HoldoverDina Powell, who led Goldman’s philanthropy, will serve as senior adviser to Trump. Obama appointee David Shulkin is Trump’s pick to lead the VA.